The Kannada TV game show Bale Bangara made Anu Prabhakar a house hold name. Her stint as the host of Home Minister further endeared her to audience. Rediff.com's Shruti Indira Lakshminarayana chats with the actress about her television and film career; bond with mom-in-law and actress Jayanthi, and her meeting with her favourite actress Juhi Chawla. It was a game show for home makers. I went to their homes and asked them fun questions related to their family. While Bale Banagara, also a game show, was shot in a studio, Home Minister gave me an opportunity to go to my audience's homes. People were really affectionate. They showered so much love just going by my screen image. I have never come out empty handed from any of the contestants' homes. I have been gifted saris and Lord Ganesha idols. In fact my team kept teasing me about how I needed to buy a new showcase for the idols. Home Minister has been a great experience and that's why I have agreed to be a part of the third season as well. I started my career through films but TV has taken me to many more hearts and homes. When I was offered Bale Bangara, I was apprehensive about taking it up as I was unsure of my Kannada skills, but today I'm glad I did the show. I have also anchored another show called Shrimati Karnataka. What about your refreshing serial Manju Musukida Haadi in which you played a modern day creative woman? It was pulled off air suddenly and I don't know why! I don't want to talk about it. I had received a lot of positive response for it and so can't imagine why the channel ended it. Even during my Home Minister shoots, women wanted to know why it was stopped. Fans are very disappointed. Yes. It was a new experience for me as I had a lot of action sequences to enact. It was not a mega serial and went up to only 70-80 episodes. I played a CBI officer who investigates a case involving the CM of the state. Though there were not many physical fights, I had to use a gun. Kaurava Venkatesh was the action director and since I knew him from my film days, I felt comfortable working with him. Are you open to action oriented roles in films as well? We'll leave that to Malashri! I mean I am not half as good as her. She was fantastic in Kiran Bedi that released recently. I whistled at her in the theatre. What did you enjoy more, anchoring game shows or acting in soaps? While anchoring shows no doubt took me closer to the audience, the urge to stand in front of the camera and perform is greater. I am an actor at the end of the day. What do you think of the present day television scenario? There are a lot of reality shows these days. While it's good exposure, I'm not for children being pushed into it. I have attended one such show as a guest judge and come out disliking the experience. Such platforms are good to showcase one's talents, but children are pressurised at times. When it comes to serials, while women are no longer confined to just the typical roles, stereotyping is definitely not a thing of the past. Either women are shown as evil or totally submissive. I can't find myself relating to either of these notions as I am somewhere in between. As an actor I wouldn't mind a ten-minute role, be it in films or serials, but it should be something that will stay in the minds of the people. I have a family to take care of. So the role should be attractive enough for me to spare my precious family time. I rather spend my time reading. I'm hungry for good roles only. Have things changed for the actor in you, after marriage? I got married three years after I entered the industry. Once you are married, there is a mental block against casting you as the heroine. That way good opportunities started reducing. But there are no regrets as I have films like Hrudaya Hrudaya, Bisi Bisi, Tavarige BaaTangi, Shaapa, for which I received an award, Sneha Loka and Dannama Devi to my credit. What has also made things easy for me is having an actress for a mother-in-law. Since she is from the same field, she understands my aspirations and concerns well. In fact she relates to my work better than my husband. Both of us in fact, bonded over the fact that we are actors. I have even acted with her in some films. She has been very supportive. Even when it comes to clothes, she likes me in western outfits. She is great fun. If given a chance to enact one of her roles, which one would you prefer? I don't think I'll be able to match her acting skills, but her role in Masanada Hoovu is my all time favourite. I am a fan of actress Aarti too. 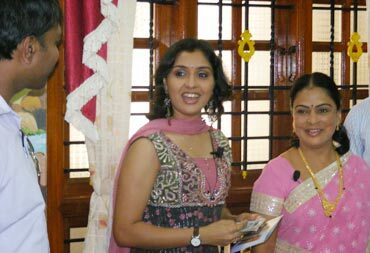 My mother Gayathri is an actor and a dubbing artiste. It is because of her that I entered the industry. I started out as a child artiste with Chapala Chennigaraya and Shanthi Kranthi. In the latter, I got to interact with one of my favourite actresses Juhi Chawla. I remember her being very nice to me. I then debuted as a lead actress with Hrudaya Hrudaya. It's been ten years since I entered the industry and today can't think of anything else I would have done. At some point though, my dream job was that of an air hostess. I am waiting for the release of my film Pareekshe in which I play a lower caste woman. The film is on the practice of casteism and I'll be happy if even ten people change their outlook after watching the film. I'll be seen speaking in North Karnataka dialect and have even acquired a tan for the role. You'll see my in tattered and muddy saris as I play the role of a daily wage worker. Next I plan to direct a film, but that may happen only five years down the lane. Right now I'm waiting for the results of my Pareekshe (Exam)! Meet Tamil TV's best known multi-tasker! From software engineer to happening heroine!